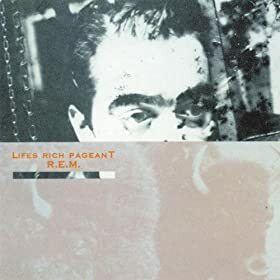 From their fourth album Life’s Rich Pageant, this song expresses so much of the sound that made R.E.M. legendary: Peter Buck’s ringing guitar, Michael Stipe’s cryptic lyrics, and Mike Mills’ fantastic background vocals. Stipe sings references to acid rain, Galileo, and the leaning tower of Pisa, but makes it all incredibly catchy. Shortly after this album, R.E.M. went on to sign the largest recording contract in history (at the time) and had their first top ten single with “The One I Love”. Tags: fall on me, lifes rich pageant, michael stipe, mike mills, peter buck, r.e.m.